XpressNet is a Command Bus developed by Lenz and used by: Atlas, Hornby, Lenz, OpenDCC (DIY), Paco Canada (DIY), Roco Viessmann and ZTC Controls. The XpressNet specification (available from the Lenz website) specifies the electrical communications standards and command set needed for devices to communicate with the command station. The XpressNet protocol allows the DCC manufacturers that use it to select what functionality they wish to provide in their command stations. This functionality ranges from "supports all features" to "bare bones minimal". Unfortunately, this restricts the features you can access via JMRI - if the hardware doesn't support it, it isn't there to be used by JMRI. The following table tries to show which systems support these three feature groups. System specific limitations are also expressed in the Limitations section of each system below. The Lenz LI100 is Lenz's original computer interface. It is limited to a serial port speed of 9,600 baud. The Lenz LI100F is an improved version of the LI100. It supports serial port speeds of 9,600 and 19,200 baud. The Factory default is 9,600 baud. The Lenz LI101F is Lenz's latest serial port based computer interface. It is significantly different than the LI100 and LI100F in physical appearance, and in the method by which the device is configured. The device is configured via a software tool provided by Lenz which runs on Windows only. We have included a configuration tool with JMRI that will allow users of other operating systems to configure their LI101F as well. The LI101F supports serial port speeds of 19,200, 38,400, 57,600, and 115,200 baud. The factory default is 19,200 baud. The Lenz LI-USB (Lenz part number 23150 ) is Lenz's first USB based computer interface. Internally, the device contains a USB to RS232 serial adapter, and an XpressNet interface circuit similar to that of the LI101F. Note: If you are using the XpressNet version 3.6 update in your command station, you should also update your LI-USB to version 3.6. There are instructions in this user group message or on the Lenz website. The device is configured via a software tool provided by Lenz which runs on Windows only. JMRI provides a tool that will allow users of other operating systems to configure their LI-USB as well. On Windows, starting with version 2.7.2, JMRI supports interfacing with the LI-USB through the Lenz LI-USB Server. The protocol used to connect to the device via USB is identical to the prior LI-USB device, so the USB connection is supported by any JMRI version with support for the LI-USB. When configuring to communicate with the device via USB, be sure that Flow Control is turned off. Connection via an Ethernet connection is available through the LI-USB Ethernet connection type, which was first made available in JMRI version 2.13.7. In addition to the Lenz purpose built computer interfaces, we have also included support for using an XpressNet Phone Adapter (XPA) as an interface to the an XpressNet based DCC system. This interface is relatively slow, and it only allows controlling mobile and stationary decoders, but it may be perfect for someone who is interested in trying out the control functions of a computer before deciding to go with a full fledged interface. Note that an XPA cannot be used to program decoders. The ZTC Controls ZTC640 is ZTC's USB interface. We have had limited experience with this device, though the current JMRI drivers are believed to be stable. Operationally, the device appears to be similar to the Lenz LI-USB. Paco Canada's GenLi is a do-it-yourself XpressNet interfaces that emulate an LI100. There is also a USB version of this device. To configure these devices in JMRI, please see the instructions for configuring the Lenz LI100. Paco Canada's Gen-LI-S88 has the same functionality as a GenLI, plus adds an S88 feedback module. It can be used to add feedback to an existing XpressNet equipped layout. To configure this devices in JMRI, please see the instructions for configuring the Lenz LI100. Paco Canada's RS2PC Interface allows adding Lenz (and compatible) RS Feedback Bus modules to a system that does not support the RS Feedback Bus. To configure this devices in JMRI, please see the instructions for configuring the Lenz LI100. Like Paco Canada's GenLi project, there is an interface called S88XpressNetLi, which is designed and built by Karst Drenth and Wim Ros, and consists of a small print (available as kit or built module) with 2 XpressNet connectors, a serial interface (9600baud at the moment), and a S88 connection (both traditional and S88-N connectors). The OpenDCC project has two interfaces for use with JMRI. The OpenDCC Command Station and the OpenDCC Gateway. These devices should be configured as LI100F devices with the port speed set to 19,200bps. The OpenDCC Command Station provides feedback via an S88 connection. JMRI supports the current version (XBus/XpressNet Version 3.0). We may add XBus Version 1.0 and 2.0 support in the future, which will allow all XBus based systems to work with JMRI. The Atlas Commander provides support only for operation of equipment on a layout (running trains and throwing switches) from JMRI. You cannot program decoders from a computer with the Commander. We provide support for the Hornby Elite using it's built in USB connection. The Elite can be used for operating equipment on a layout (running trains and throwing switches) and for programming from JMRI. It is unknown at this point in time if we can control either an Elite or a Select using one of the other interfaces. Hornby's manuals warn against using their equipment with that of other manufacturers, so we expect some incompatibilities in this area. We have a pretty good handle on what instructions each Lenz Command station should support. If you find that you cannot perform a function you think you should be able to using a Lenz system and the LI100, LI101F or LI-USB, please let us know. LZ100 and LZV100-based systems support the full range of JMRI functionality. The LZ100 is the command station used in the Set-01. The LZV100 is the command station used in the Set-90, Set-100, and Set-LI. The LH200 provides support only for operating equipment on a layout (running trains and throwing switches) from JMRI. The LH200 is the command station used in the Set-02. You can't program decoders from a computer with Set-02. The Compact is the same device as the Atlas Commander, and has the same restrictions as the commander. The Compact is not available in North America. If you have either an LH200 or a Compact, and wish to add computer control to your layout, an XPA and Hayes Compatible Modem may be a more cost effective solution than the LI100, LI100F, LI101F, or LI-USB. The BlackBox is a standalone decoder programmer. It can be connected through an XpressNet interface (such as the LI101F, etc) with a suitable cable. There are some instructions for creating that cable in the LZV100 manual. The BlackBox only does programming, and cannot operate either locomotives or accessory decoders (turnouts) on the layout. Note: Roco calls their XpressNet implementation "RocoNet". The Roco LocoMaus 2 (Roco Part number 10760) has been shown to support operating equipment on a layout (running trains and throwing switches) as well as programming locomotives on the programming track. For programming in service mode, the LocoMaus 2 appears to only be able to write to CV's. It is not known at this point in time if the LocoMaus 2 supports Operations Mode Programming. The LocoMaus 2 does not support feedback. The Roco MultiMaus (Roco Part number 10810) has been shown to support operating equipment on a layout (running trains and throwing switches) and programming locomotives in both service and operations mode. The Roco multiZENTRAL-PRO (Roco Part number 10830) is the new command station for use with Roco's MultiMaus-PRO wireless throttles. The unit features a built in USB port, but it is unknown at this time how we can utilize it. The multiZENTRAL-PRO also provides ports for connecting a RocoNet device (MultiMaus, LocoMaus 2, etc). These ports can be used to connect one of the supported XpressNet computer interfaces, but it is unknown at this point what, if any, limitations exist when using this connection. The OpenDCC Command Station should be supported by JMRI through either the RS232 port or the built in USB port. This device should be configured as an LI100F device with the port speed set to 19,200 bps. Paco Canada has two versions of his do-it-yourself Nanox DCC system available, both are compatible with JMRI. The original NanoX DCC system supports operating equipment on a layout (running trains and throwing switches) and programming locomotives. The NanoX-S88 adds feedback capabilities to the NanoX system. This feedback comes through the use of S88 compatible feedback modules. Paco Canada also provides two methods for adding feedback to non-feedback equipped systems. The Gen-LI-S88is an XpressNet interface that includes an S88 feedback module, so it can be used to add feedback to an existing XpressNet equipped layout. The RS2PC interface allows adding Lenz (and compatible) RS Feedback Bus modules to a system that does not support the RS Feedback Bus. This device does not require an XpressNet connection. The Viessmann Commander's Low Speed Bus port supports the XpressNet protocol. We should be able to use this to connect using one of the supported XpressNet computer interfaces, but the limitations of this port have not been determined. Viessmann has indicated the Commander's built in USB port can only be used for updating the firmware and sending data to the commander, not for operating the device. The ZTC Controls ZTC511 (with Command Station software version 4.0) has been shown to support operating equipment on a layout (running trains and throwing switches). The ZTC511 does not support any programming operations from XpressNet devices. The onboard serial interface of the ZTC511 is not supported at this point in time. The ZTC521 (with XBus V3.0 software) has yet to be tested, so the full extent of what is supported is not known at this time. You can use any of the Lenz or ZTC interfaces listed above to connect to a ZTC system that supports the XpressNet (aka X-Bus V3.0) protocol. If you have either ZTC system and wish to add computer control to your layout, an XPA and Hayes Compatible Modem may be a more cost effective solution than one of the purpose built interfaces. If you choose to use an XPA and a Hayes Compatible Modem to control your XpressNet based system, you will be limited to control of locomotives and accessory decoders. You cannot program decoders from a computer using the XPA, regardless of which system you have. While the Command Stations mentioned on this page support the same commands over the XpressNet connection, they do not all use the same hardware connectors. It may be necessary to build an adapter to plug an XpressNet accessory into a Command Station from another manufacturer. Connect your Lenz LI100, LI100F, or LI101F to your DCC Command station via their XpressNet connections. Then connect the LI100/LI100F/LI101F to the computer's serial port using a 9-pin serial cable. Select your Lenz interface (LI100,LI100F, or LI101F) from the top selection box. You can then select the proper serial port in the second selection box. The baud rate selection box should be set to match your LI100, or LI100F, or LI101F. From the factory, the LI100 and LI100F are set to 9600 baud. The LI101F is set to 19,200 baud. The fourth box should be left on "hardware flow control" unless you later consistently get a message about the LI100 control leads being improperly set up, in which case you might want to try to bypass that by selecting "no flow control". This option has been removed starting in version 2.9.5 Check Buffer Status When Sending? Defaults to "yes" on Windows and Linux, and "no" on MacOS 8/9 and Mac OS X. Except when debugging problems, you should leave this at the default. To connect your computer to one of these XpressNet based DCC systems, you can use a Lenz LI-USB interface unit. Connect the LI-USB to your DCC command station via their XpressNet connections. Then connect the LI-USB to your computer's USB port using the supplied cable. For the LI-USB (Lenz part Number 23150) with JMRI, you must first install a software driver on your computer. Internally, the device contains a FTDI FT232BM USB to Serial converter. There are two drivers available for this device, make sure you obtain the Virtual Comm Port (VCP) driver. The device drivers for Windows are included on the CD that comes with the device. The device drivers for Linux are included with recent versions of the Linux kernel. Device drivers for Linux, and MacOS (8,9 and X ) and Windows are available from the FTDI website (direct link to the drivers current as of this writing: http://www.ftdichip.com/Drivers/VCP.htm). Fort the LI-USB-Ethernet (Lenz part Number 23151) in USB mode with JMRI, you must first install a software driver on your computer. Internally, the device contains a The USB connection on the device is provided by a Microchip chipset that registers itself as a USB CDC-ACM (Abstract Control Model) device. Functionally, the device acts like a serial port. The Lenz documentation indicates the drivers for Windows 7 and MacOS are installed automatically if the computer is connected to the internet. For Linux, the drivers are part of the standard kernel distribution. When the device drivers are installed, and the LI-USB is connected to both your PC and your DCC system, the LI-USB should have a Red LED turned on, indicating the XpressNet connection is OK, and a green LED turned on, indicating the USB connection is OK. NOTE: If you have installed the Lenz software, make sure none of it is running. This includes the LI-Server, which may be running in the background. Select "Lenz LI-USB" from the top selection box. You can then select the proper serial port in the second selection box. The baud rate selection box should be set to 57,600 baud. (for the Lenz LI-USB, Lenz Part 23150) left on "hardware flow control" unless you later consistently get a message about the LI-USB control leads being improperly set up, in which case you might want to try to bypass that by selecting "no flow control". (for the Lenz LI-USB-Ethernet, Lenz Part 23151) set to "no flow control" (the LI-USB-Ethernet does not support flow control). This option has been removed starting in JMRI version 2.9.5 Check Buffer Status When Sending? Defaults to "Yes" on Windows and Linux, and "No" on MacOS 8/9 and Mac OS X. Except when debugging problems, you should leave this at the default. 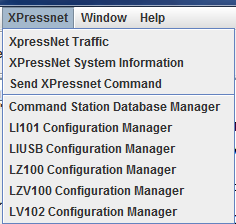 To connect your computer to one of these XpressNet based DCC systems, you can use a Lenz LI-USB interface unit and the Lenz LI-USB Server software. Connect the LI-USB to your DCC command station via their XpressNet connections. Then connect the LI-USB to your computer's USB port using the supplied cable. In order to use the LI-USB server with JMRI, you must first install the Lenz drivers and software. These are provided on the CD that comes with the LI-USB. NOTE: to use the LI-USB server, you MUST install the Lenz software and the LI-Server must be running. Select "Lenz LI-USB Server" from the top selection box. There are no additional configuration steps required to use the LI-Server. Note: The first JMRI release supporting the Lenz LI-USB Ethernet connection was v 2.13.7. To connect your computer to one of these XpressNet based DCC systems, you can use a Lenz LI-USB Ethernet interface unit in Ethernet mode. Connect the LI-USB to your DCC Command Station via their XpressNet connection, then connect the LI-USB Ethernet to your computer Network using the supplied Ethernet cable. When the device is properly connected to the XpressNet, the Red XpressNet LED will turn on. When the Ethernet is properly connected, a Green status LED will turn on. This LED is located on the ethernet port itself. This signals the drivers are installed, and the LI-USB is connected. Once the device is connected, refer to the device documentation for information on setting the IP address. The default IP address is 192.168.0.200. Make note of the IP address for use when configuring the device. If the IP address is unknown, and your system supports auto-configuration via the MDNS protocol (also known as Bonjour), you can open a web browser to http://XPressNet.local./. Automatic configuration is optional if you set the IP Address of your LI-USB-Ethernet device to a fixed value. If you use DHCP to configure the LI-USB-Ethernet's IP address, it is highly recommended that you use Automatic Configuration. Select "XpressNet Simulator" from the top selection box. There are no additional configuration steps required to use the XpressNet Simulator. To connect your computer to one of these XpressNet based DCC systems, you can use a ZTC ZTC640 interface unit. Connect the ZTC640 to your DCC command station via their XpressNet connections. Then connect the ZTC640 to your computer's USB port using the supplied cable. In order to use the ZTC640 with JMRI, you must first install a software driver on your computer. Internally, the device contains a FTDI FT232BM USB to Serial converter. There are two drivers available for this device, make sure you obtain the Virtual Comm Port (VCP) driver. When the device drivers are installed, and the ZTC640 is connected to both your PC and your DCC system, the ZTC640 should have a Red LED turned on, indicating the XpressNet connection is okay, and a green LED turned on, indicating the USB connection is okay. Select "ZTC Controls ZTC640" from the top selection box. You can then select the proper serial port in the second selection box. The baud rate selection box should be set to 19,200 baud. The fourth box should be left on "no flow control". Click "Save". You'll be asked if it's okay for the program to quit; click "Yes". To connect your computer to the Hornby Elite using it's built in USB connection, connect your Hornby Elite's USB port and the computer's USB port using the supplied cable. In order to use the Hornby Elite's built in USB port, you must first install a software driver on your computer. The device drivers for Windows are included on the CD that comes with the device and from the Hornby Website. It is unknown at this point if there are device drivers available for MacOS or Linux. The Hornby Elite has a Green LED that illuminates when it is recognized by the computer. Select "Hornby Elite USB port" from the top selection box. You can then select the proper serial port in the second selection box. Note: The first JMRI release supporting the XnTcp adapter is 2.1.5 More information on the XnTcp adapter can be found on its home page. Instructions for configuring JMRI to connect to an XnTcp adapter can be found on the adapters configuration page. During configuration, the program tries to find all interfaces available on the LAN by broadcasting a UDP request. Any adapter(s) present will reply with their NetBios name, which can then be selected. The preferences store the NetBios name of the interface, rather than the storing the IP address digits, since the IP address can change due to DHCP addressing. We have developed an alternative method for connecting to an XpressNet based system which should prove to be more cost effective on XpressNet based systems that do not support programming or feedback via the LI100, LI100F, or LI101F computer interfaces, or for those who are interested in experimenting with computer control, but don't need all the features supported by the Lenz interfaces. This system uses the Lenz XpressNet Phone Adapter and a Hayes Compatible modem to provide control of locomotives and stationary decoders. Connect your computer to a Hayes Compatible modem - either a built-in modem card or an external serial modem. Next, Connect the "Phone In" jack on your XPA to the "Wall In" jack on your modem using the cable supplied with the XPA for connecting a telephone to the XPA. Select "XPA-Modem" from the top selection box. You can then select the proper serial port in the second selection box. The baud rate selection box should default to 9600 baud. At this point in time, this can not be changed. XpressNet System Information - This tool displays the software version and type of the Command Station and the software version of the LI100/LI100F/LI101F connected to the computer.